Inside you will learn: Understanding the problem discover your own unique behavioral pattern, when you procrastinate and in what situations you tend to delay doing things more. Explore how procrastination touches every facet of your life, not just your work or career. How to create the connections between deep-seated emotions and your actions in day to day situations. How to create the perfect goals that will eliminate procrastination for good. Discover your true purpose in life with this one simple step Consciously create the most ideal circumstances in the present so you wont have to worry about the future. The higher connections between desires, needs and your lifes true purpose. What makes goals effective in eradicating procrastination completely from ones life? How to increase the clarity of your goals in life. Do you know how to see the Big Picture or are you stuck with small issues and troubles in life? 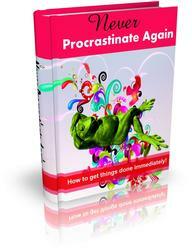 Finally discover the hidden Trouble Spots in your life that are causing you to procrastinate without knowing it! 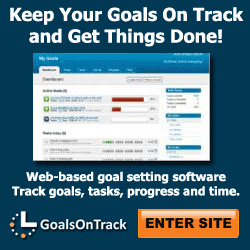 Improve your handling of goals in life so you wont be side-tracked by procrastination anymore. Motivating oneself to pursue short term and long term goals. 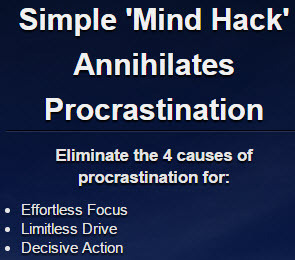 Learn Fun And Innovative Tools To Stop Procrastination And Overwhelm Without Using Will Power. Receive Video And Audio Tips And Be Part Of A Private Members Forum And Community. 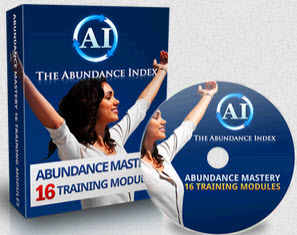 Heres Everything You Get as a Member: Three Short Videos Per Month. These are bite-sized nuggets of Powerful. information. 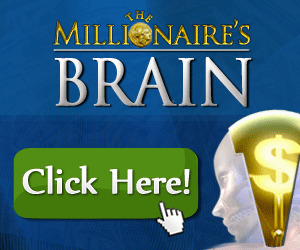 Each video contains a Potent Tool of the Procrastination Cure, including new, never before released information. Youll receive an email every 10 days with a link to your New Video Tip. Downloadable Audio Clips of each of the tips, so that you can load the tools onto your mp3 player and take them with you wherever you go. This is the Coach in Your Pocket part to help you out whenever you could use a boost! Again, youll be emailed every time a new Audio Tip is available. 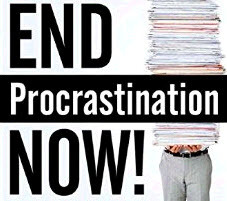 Be Part of the Procrastination Cure Club Private Facebook Forum where you will be inspired on a daily basis as you read about the miracles that are happening every day in the lives of your fellow club members. Just drop in and read or post at your convenience. Overcoming anxiety or depression is tough and sometimes even frightening work. (Even positive change evokes fear in most people ) As a result, people tend to resist, avoid, or procrastinate working on their problems. This means you have to be on the lookout for self-sabotage. 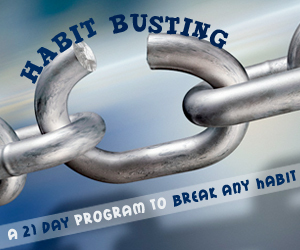 Self-sabotage describes the things you do to keep from addressing and correcting your problems, and it appears in various forms and disguises. One of my success mentors, the great Jim Rohn, taught me something about time management I'll never forget He said, Never start your day until you've finished it. Incredibly simple, yet profound advice. Always be thinking ahead to the next day and plan the entire day in advance so you'll never be caught off guard without your food. Nicholls' analysis suggests that children early in the middle childhood period of life are likely to believe that they can get better by working harder and that failures result primarily from a lack of effort. If they live in a culture that stresses the moral importance of working hard (vs. being lazy), failures during this period may make children feel guilty rather than incompetent. Both Burhans and Dweck (1995) and Harter (1998) found that preschool children do report thinking they are bad people if they fail at tasks their parents and teachers highly value. Similarly, Heyman, Dweck, and Cain (1993) and Stipek, Recchia, and McClintic (1992) found that some children as young as 2 react both behaviorally and emotionally to failure experiences. On the positive side, such attributions leave open the belief that one can get better. For the patient with comorbidity, the problem list likely includes difficulties related to both depression and the anxiety disorder. Some of these problems may result from the depression, the anxiety, or both disorders. The patient's mood, cognitive, behavioral, situational, and interpersonal difficulties need to be described in concrete terms. For GAD, OCD, and PTSD, avoidance may be a particularly prominent problem. Patients with GAD may use worry as a way to avoid more salient emotional topics (Borkovec, 1994), whereas patients with OCD may avoid stimuli that trigger their obsessions and compulsions, and patients with PTSD may avoid situations that trigger their intrusive thoughts related to the traumatic event. Unique problems for patients with GAD might include uncontrollable worry, muscle tension, interpersonal problems as a result of reassurance-seeking behavior, time-management problems or poor problem-solving skills. Probably the most important goal you can have at any time is your three-month goal. Three months is the perfect time frame for your short-term goal because a lot can happen in three months. Most people can completely transform their bodies in 90 days. A sensible and realistic 90-day goal would be to lose up to 6 body fat and 12 to 24 pounds. The three-month goal is important because long-term goals don't have any urgency. A one-year goal is so distant, you may find that you tend to procrastinate more without the impending deadline. The foremost characteristic of the vata metabolic type is changeability. People of this type are active, energetic, moody, imaginative, and impulsive prone to erratic sleep patterns, intestinal problems, nervous disorders, and premenstrual syndrome. There is a sensitivity to cold and dry and their vulnerable season is autumn. Pitta types are predictable, aggressive, intense, efficient, articulate, moderate in daily habits, short-tempered, and impatient. They tend to perspire more and may be open to poor digestion, ulcers, skin inflammations, hemorrhoids, and heartburn. In summer they are sensitive to the sun and heat. Kapha is relaxed, stable, conservative, with a tendency to laziness and procrastination. They sleep long and move, eat, and digest food slowly. There is an inclination toward overweight, allergies, sinus, and lung congestion and they are highly susceptible to the cold of winter. Get All The Support And Guidance You Need To Be A Success At Getting Things Done. This Book Is One Of The Most Valuable Resources In The World When It Comes To Getting Things Done.